Modern software is built on top of piles of third-party components. The holy grail of reusable code has manifested in the form of an open source ecosystem. That said, in a startup, you rarely have time to audit the third-party components you use. These third-party components might be ridiculous enough to call abort() on error. It may sound scary, but with a fixed amount of work, you can turn these calls into reported structured exceptions. // for example.) Since raise() resets the signal handler, put it back. 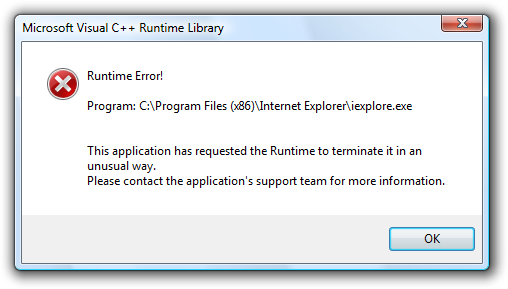 C++ is aggressive about making sure you don’t throw an exception while another exception is in the air. If you do, its default behavior is to terminate your process. From MSDN: If a matching handler is still not found, or if an exception occurs while unwinding, but before the handler gets control, the predefined run-time function terminate is called. If an exception occurs after throwing the exception, but before the unwind begins, terminate is called. The IMVU client is compiled with _SECURE_SCL enabled. Increased reliability from knowing exactly where failures occur is more important than the very minor performance hit of validating all iterator accesses. There are two ways to convert invalid iterator uses into reported exceptions. The easiest is compiling with _SECURE_SCL_THROWS=1. Otherwise, just install your own invalid_parameter handler with _set_invalid_parameter_handler. 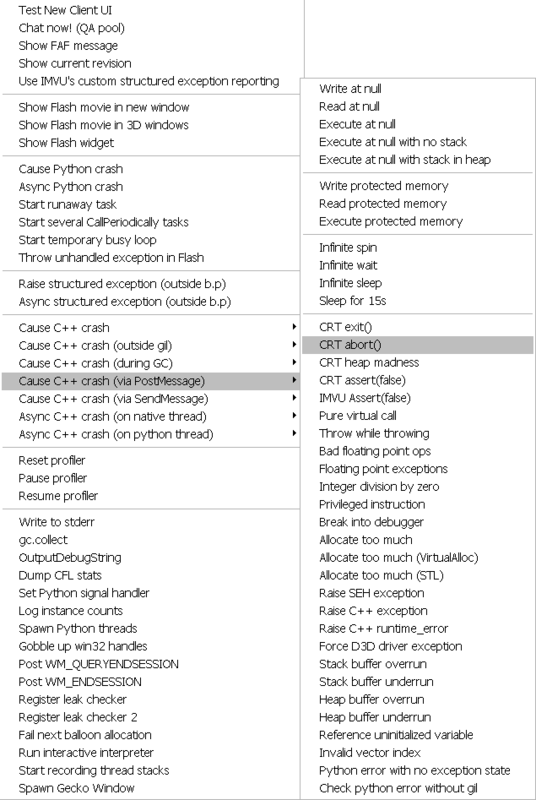 By default, Visual C++ generates code that detects and reports stack buffer overruns. This prevents a common class of application security holes. Unfortunately, the stock implementation of this feature does not allow you to install your own handler, which means you can’t report any buffer overruns. Again, we can shadow a CRT function to handle these failures. From C:\Program Files\Microsoft Visual Studio 8\VC\crt\src\gs_report.c, copy the __report_gsfailure function into your application. (You did install the CRT source, didn’t you?) Instead of calling UnhandledExceptionFilter at the bottom of __report_gsfailure, call your own last-chance handler or write a minidump. These types of failures are rare, but when we hit them, I’m glad we implemented this reporting. How we can shadow __report_gsfailure without recompiling CRT ? It’s called inside CRT dll as far as I understand it. Next Next post: IMVU’s CallStack API Now Open Source!